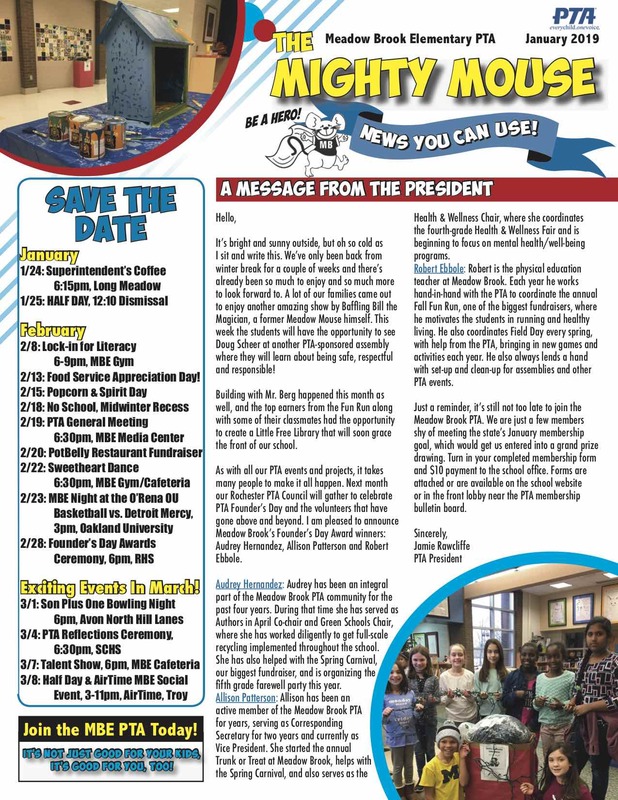 Some Ways To Get Involved In MBE PTA – It’s All About Our Kids! The PTA is looking for staff and parents who are willing and able to help with a few different upcoming projects. 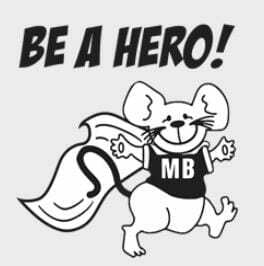 Our Health & Wellness Team is starting a Kindness/Positivity/Hero committee to look into ways to incorporate more kindness and positivity projects/activities into the school. There will be a meeting this Monday, Feb. 11th at 9:30 a.m. in the planning. 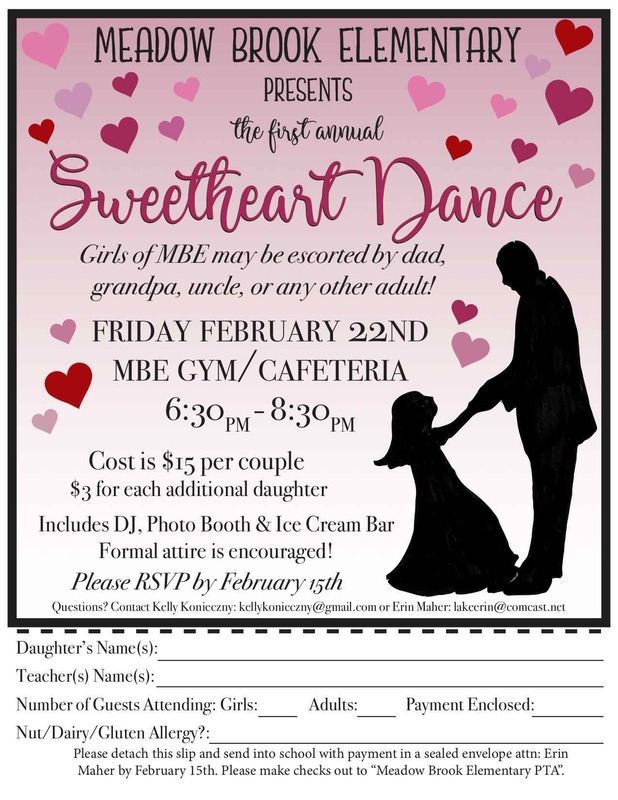 If you’d like to help out, but can’t make the meeting, contact Allison Patterson (algal1@ameritech.net). Also, as part of our continued School of Excellence improvement plan, we are looking for ways to incorporate signs throughout the school in multiple languages and would love to get some help from those of you who speak other languages. If you are interested in helping out with this project, please email ptameadowbrookelementary@gmail.com. Love to read and share books with students? The Authors in April (AIA) team is looking for parent volunteers to read books by this year’s authors in the classrooms. If you are interested in volunteering, please contact Jamie Rawcliffe (Jamie.rawcliffe@gmail.com). Thanks for considering these exciting opportunities! 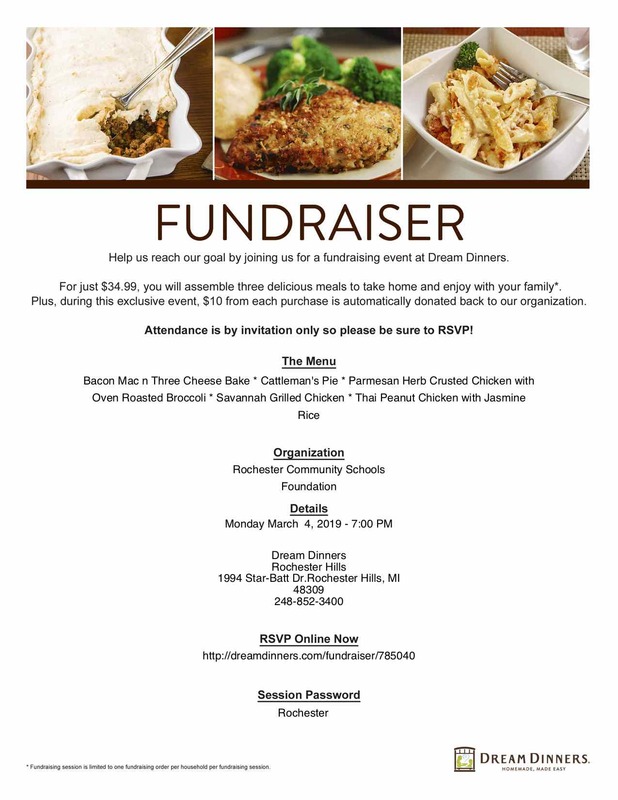 An RCS Foundation “Dream Dinners” Fund Raiser! 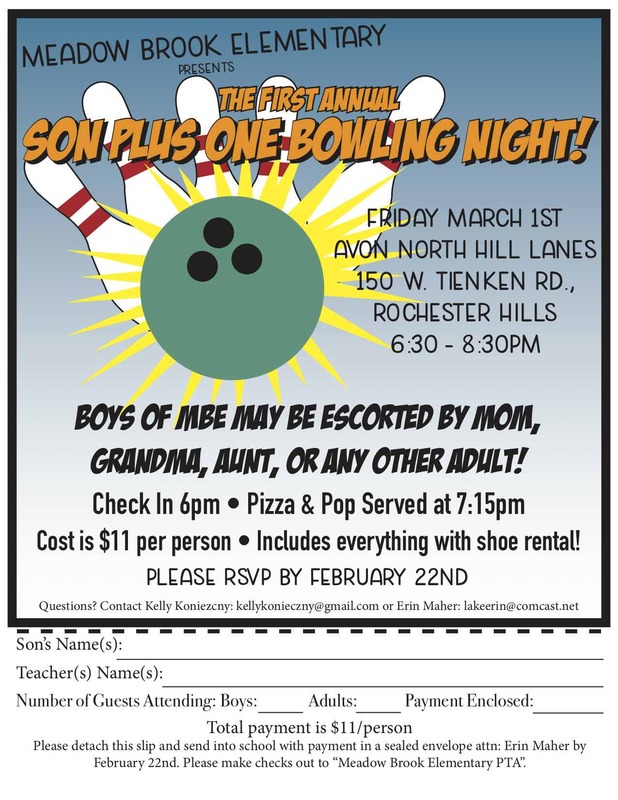 MBE Mother/Son Bowling is Coming! 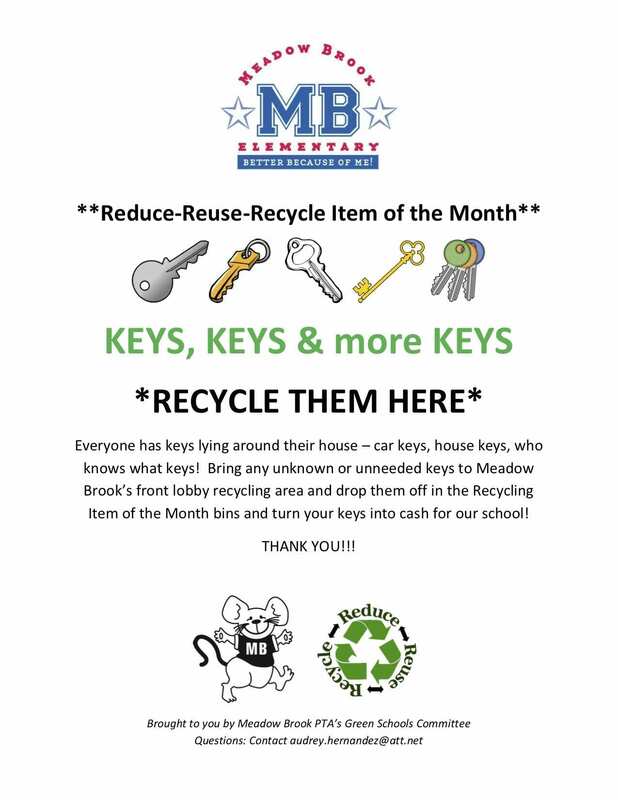 MBE Green Schools Update & Green Scene News! The MB Green Schools committee once again collected old and broken holiday lights to recycle. We collected a large box full – 215 lbs worth! That translated to just over $15 – way to go Meadow Brook! All the lights (along with the other items from the electronics/cell phone bin in the lobby) were taken to Rochester Recycling to be properly recycled. Congratulations to Rochester & Adams High schools that had their Recylebank Grants accepted! 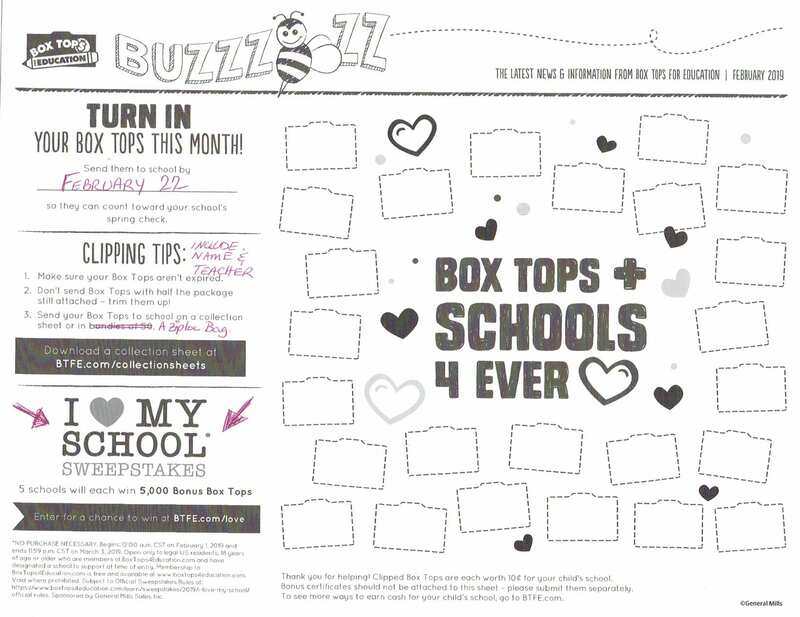 Check them out here Green Schools Donations. Let’s help to get the projects funded at our students’ future high schools! 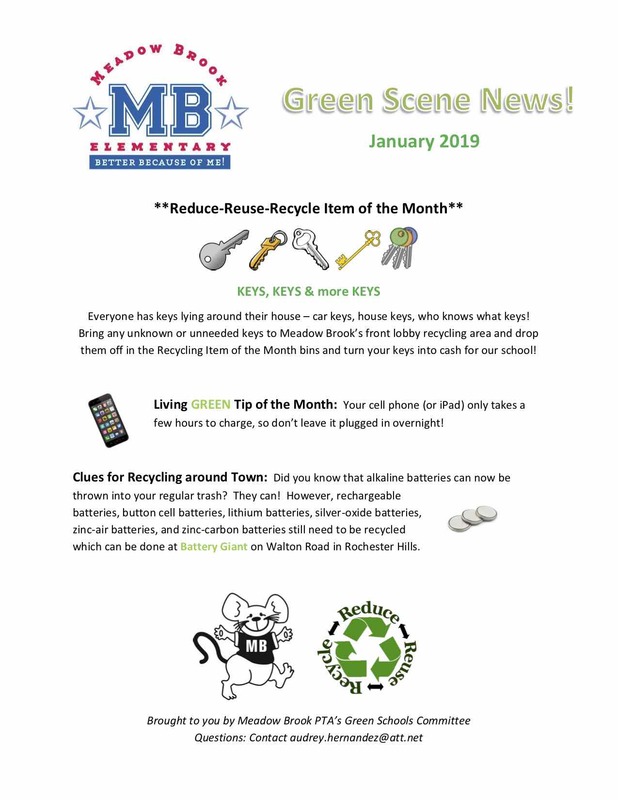 Please see the MB Green Schools first monthly Green Scene News where we will be providing monthly recycle/reuse/reduce items, a living green tip, and information to help you recycle additional household items around town. Congratulations To Our PTA Founder’s Day Nominees! Congratulations to Meadow Brook’s PTA Founder’s Day Nominees! Audrey Hernandez: Audrey has been an integral part of the Meadow Brook PTA community for the past four years. During that time she has served as Authors in April Co-chair and Green Schools Chair, where she has worked diligently to get full-scale recycling implemented throughout the school. She has also helped with the Spring Carnival, our biggest fundraiser, and is organizing the fifth grade farewell party this year. Allison Patterson: Allison has been an active member of the Meadow Brook PTA for years, serving as Corresponding Secretary for two years and currently as Vice President. She started the annual Trunk or Treat at Meadow Brook, helps with the Spring Carnival, and also serves as the Health & Wellness Chair, where she coordinates the fourth-grade Health & Wellness Fair and is beginning to focus on mental health/well-being programs. Robert Ebbole: Robert is the physical education teacher at Meadow Brook. Each year he works hand-in-hand with the PTA to coordinate the annual Fall Fun Run, one of the biggest fundraisers, where he motivates the students in running and healthy living. He also coordinates Field Day every spring, with help from the PTA, bringing in new games and activities each year. He also always lends a hand with set-up and clean-up for assemblies and other PTA events. 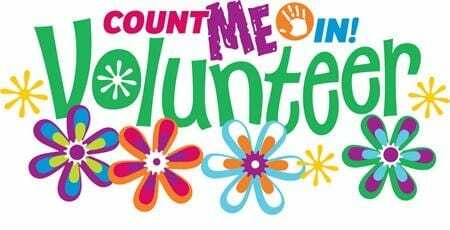 The PTA Needs You: Upcoming Volunteer Opportunities! Our Health & Wellness Team is starting a Kindness/Positivity/Hero committee to look into ways to incorporate more kindness and positivity projects/activities into the school. The committee will be meeting this Wednesday Jan. 23 at 9:30 a.m. in the planning room. If you’d like to help out but can’t make this meeting, contact Allison Patterson (algal1@ameritech.net). Also, as part of our continued School of Excellence improvement plan, we are looking for ways to incorporate signs throughout the school in multiple languages and would love to get some help from those of you who speak other languages. If you are interested in helping out with this project, please email ptameadowbrookelementary@gmail.com.